Purchase Of Spares For MACK Trailer & Fittings Tender. 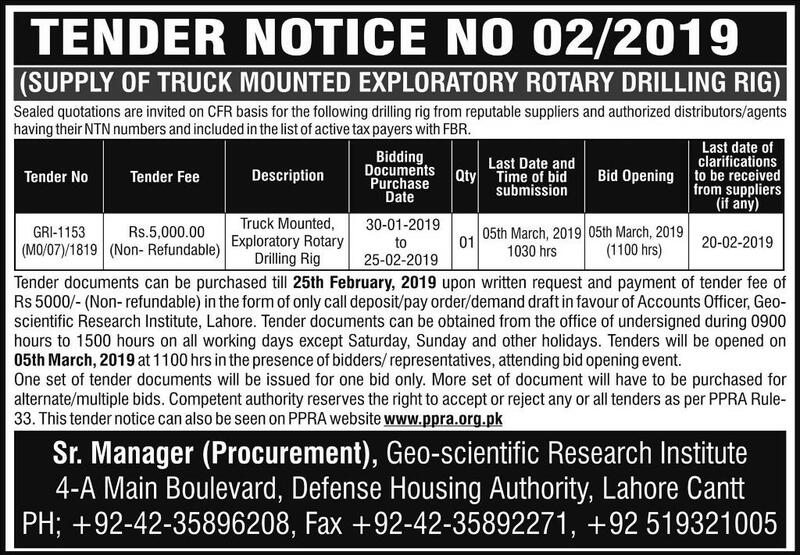 Tender Supply of Truck Mounted Exploratory Rotary Drilling Rig 2019. 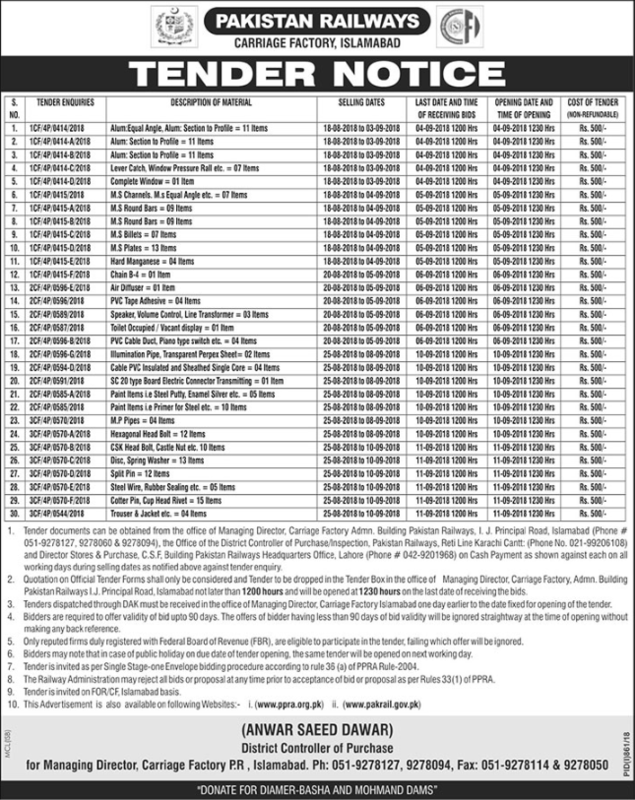 Tender Notice Rawalpindi Cantonment Board Sept. 2018. Copyright The Daily the Express Newspaper Pakistan. 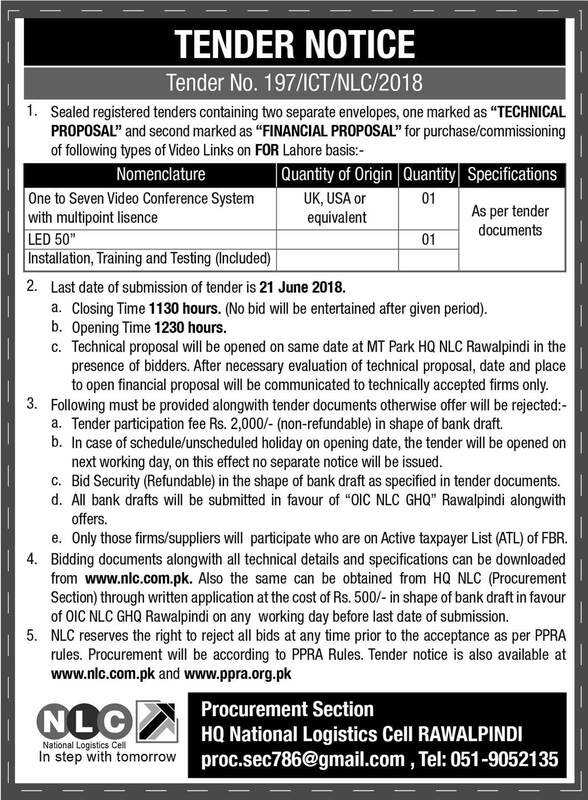 Pakistan Television News Islamabad Tender For Canteen August 2018. 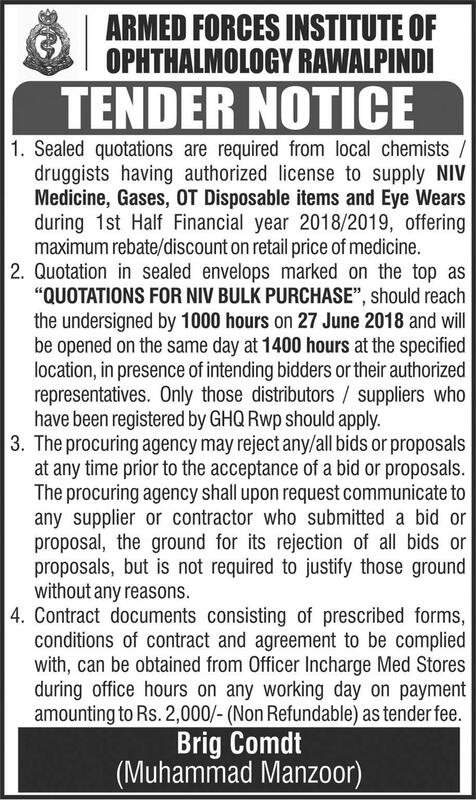 Copyright The Daily The News Newspaper Pakistan. 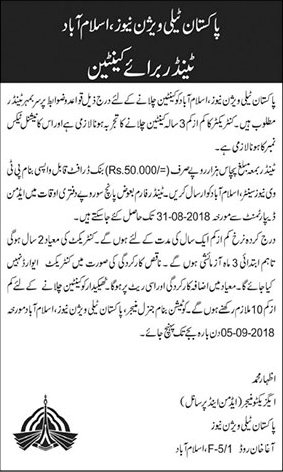 Tender Notice Pakistan Railways Carriage Factory Islamabad August 2018. Copyright The Daily The News Newspaper Pakistan. 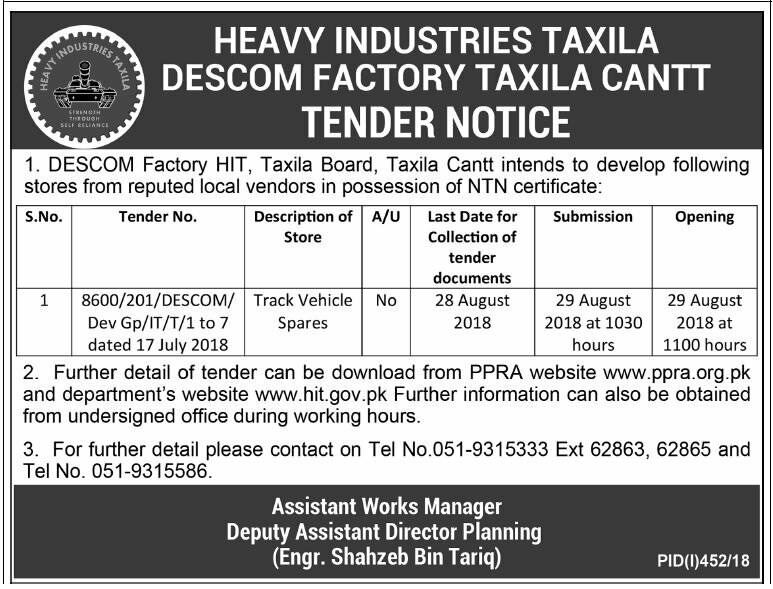 Tender Heavy Industries Taxila Descom Factory Aug. 2018. Copyright The Daily The Tribune Newspaper Pakistan. 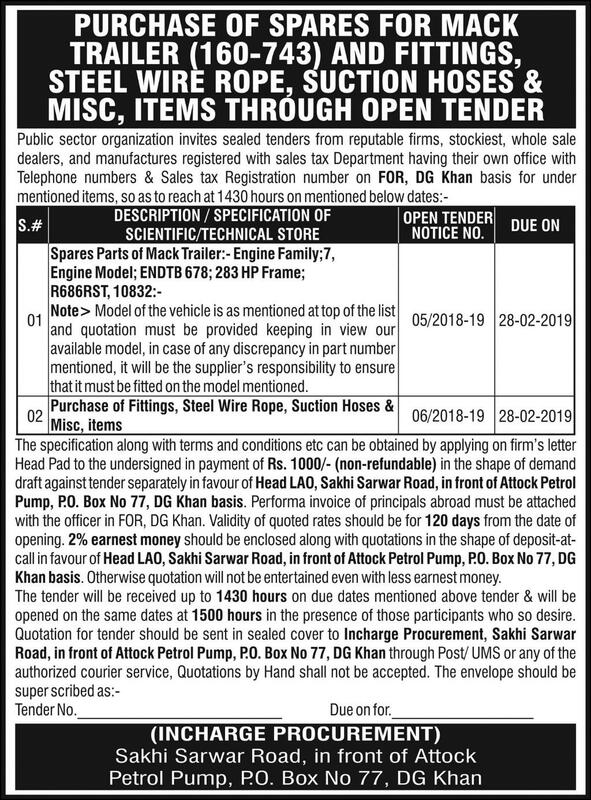 Tender Notice Office of The Executive Engineer Public Health Engg. Mirpurkhas. Copyright The Daily The Tribune Newspaper Pakistan. 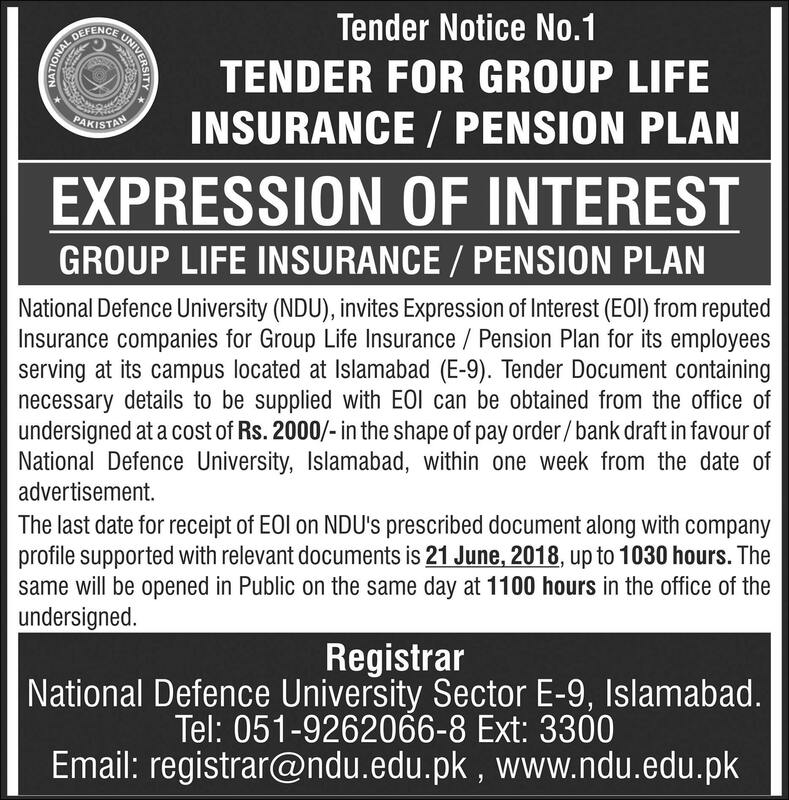 Tender Notice Armed Forces Institute Of Ophthalmology Rawalpindi. Copyright The Daily The Tribune Newspaper Pakistan. 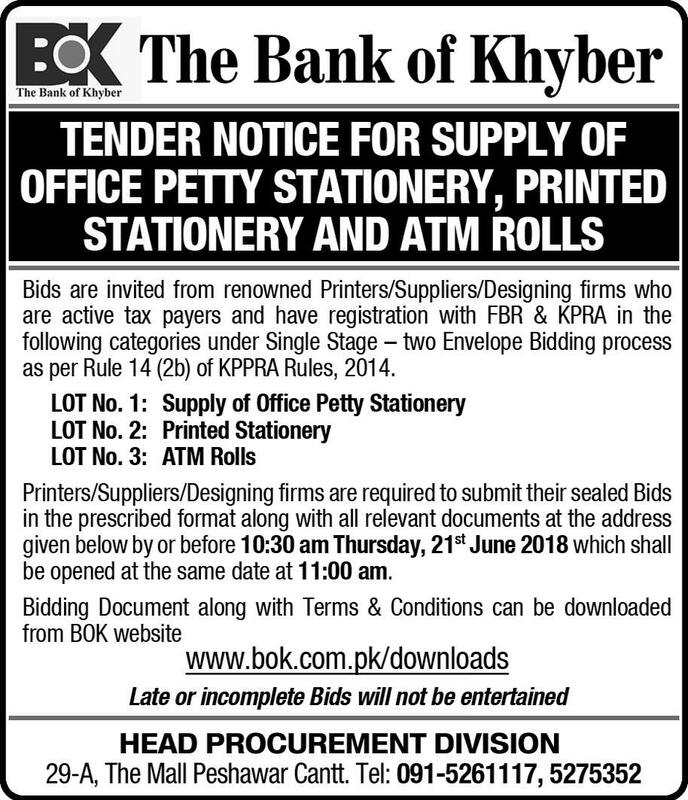 Tender Notice For Supply of Office Petty Stationery & ATM Rolls. Copyright The Daily The Tribune Newspaper Pakistan. 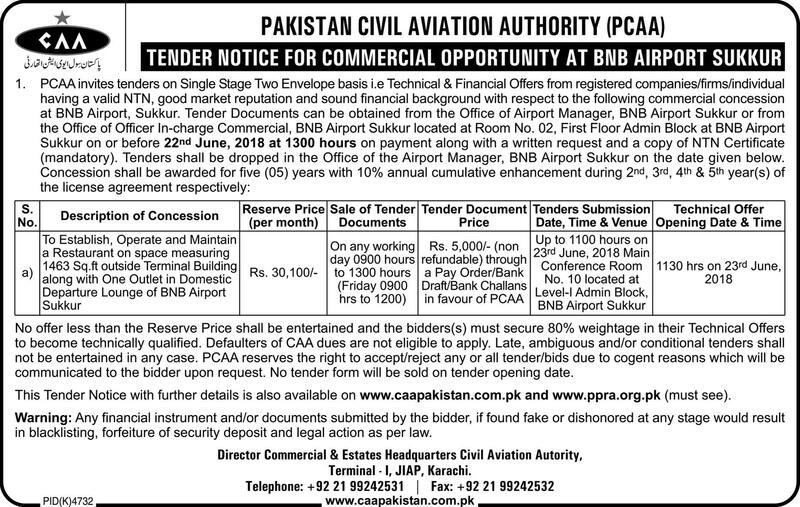 Pakistan Civil Aviation Authority (PCAA) Tender Notice BNB Airport Sukkur. Copyright The Daily The Tribune Newspaper Pakistan. 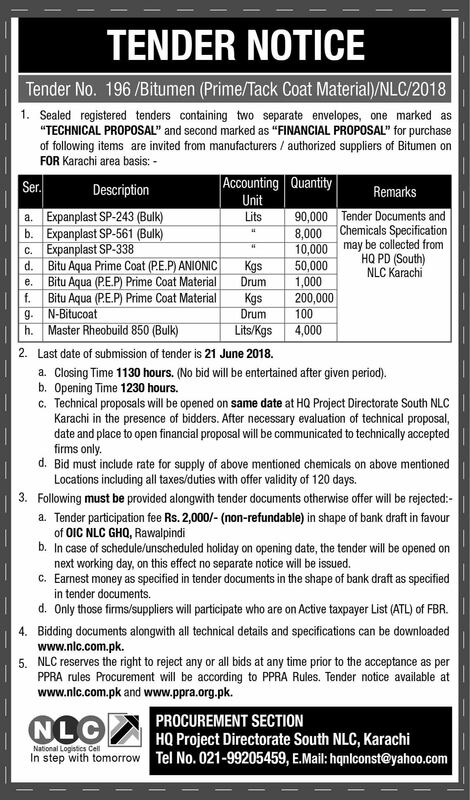 Sindh Bank Notice Inviting Tenders 05-06-2018. Copyright The Daily The Tribune Newspaper Pakistan. 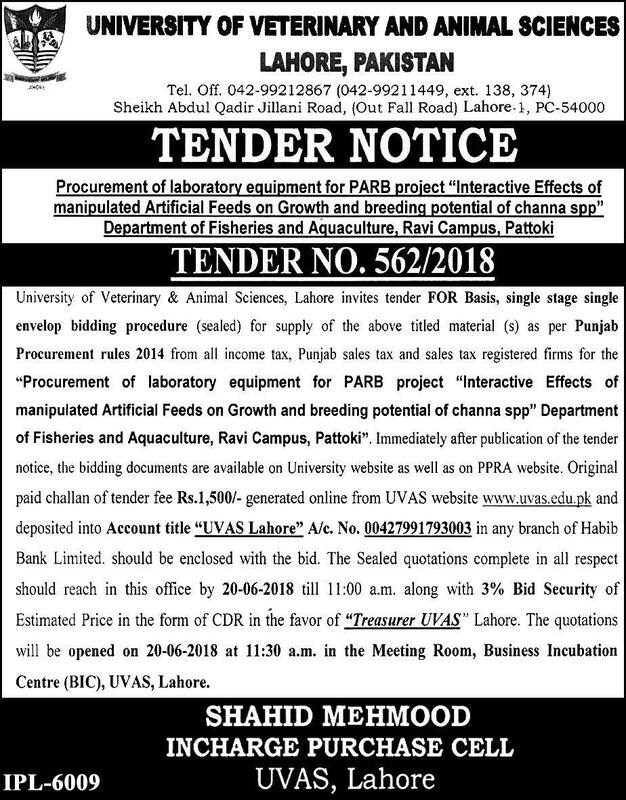 Tender Notice University Of Veterinary & Animal Sciences Lahore Pakistan. Copyright The Daily The Tribune Newspaper Pakistan. 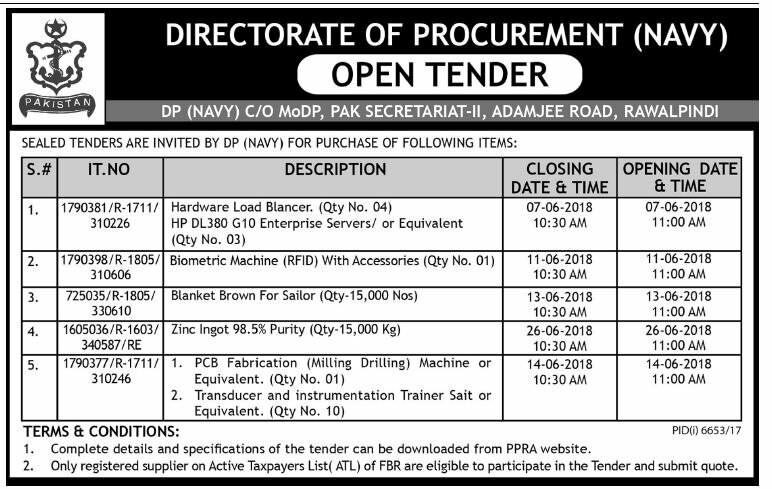 Directorate Of Procurement (Navy) Open Tender 03-06-2018. Copyright The Daily The Tribune Newspaper Pakistan. 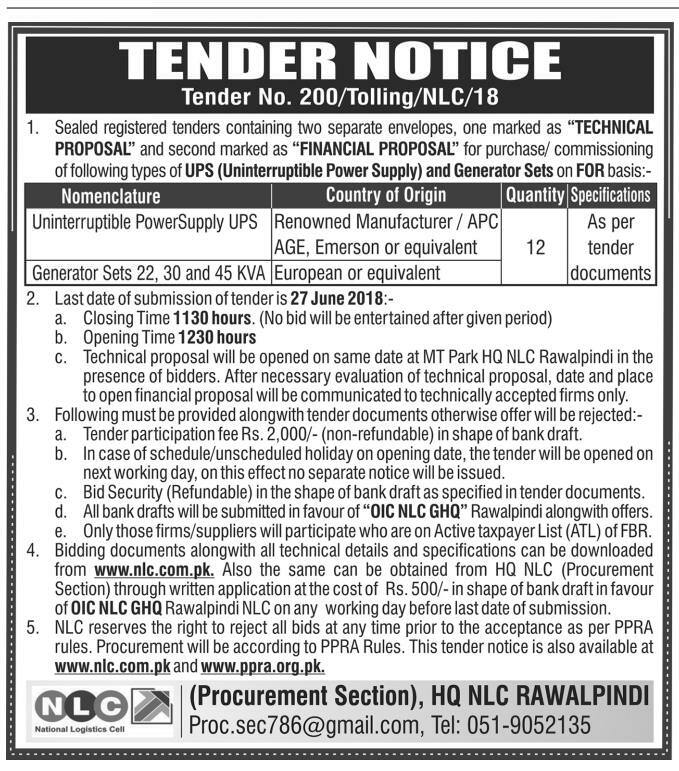 NLC Tender Notice 02-06-2018. Copyright The Daily The Tribune Newspaper Pakistan. 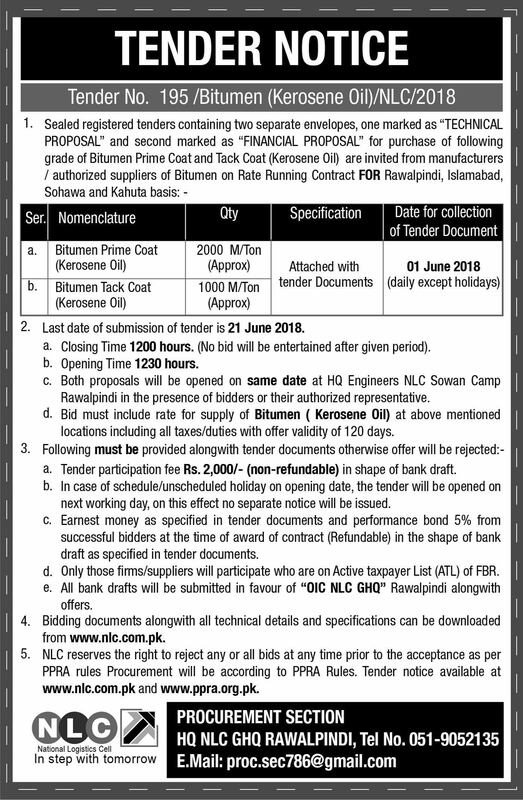 Notice Inviting Tender Irrigation Division Ziarat Balochistan. Copyright The Daily The Tribune Newspaper Pakistan. 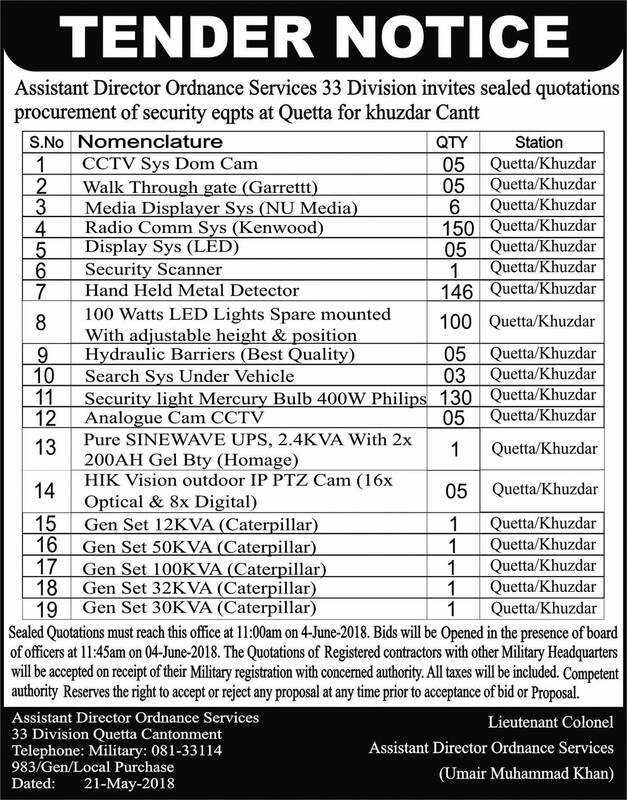 Tender Notice Assistant Director Ordnance Services 33 Division. Copyright The Daily The Tribune Newspaper Pakistan.